Chef Lams Restaurant offers Chinese and Thai cuisine in the Craigmore area. For this project we dined in and took some photos, and absolutely loved the food. If your in the Craigmore area I can highly recommend their restaurant for great food and service. 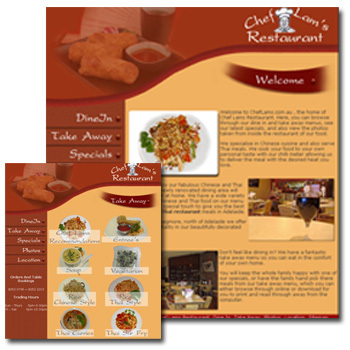 This web site design shows off their take away menu, and also gives you a look at the surroundings inside the restaurant.